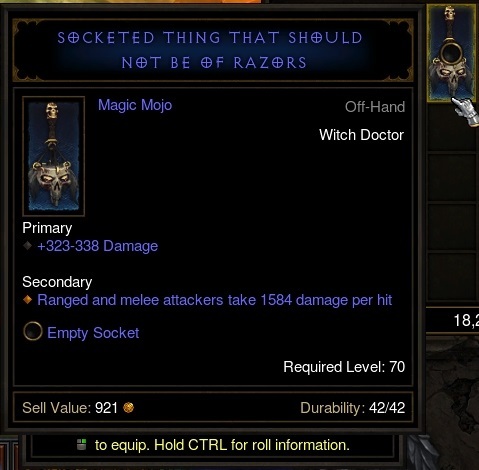 Is “Socketed Thing That Should Not Be Of Razors” real or a bug? I can only assume that this items label has not been replaced as it's clearly a description of the item rather than a name I think. So is this a real item or is it a bug / easter egg? It's a real item; the base item is the "Thing That Should Not Be"; that is, something that's unnatural or shouldn't exist in this world. Seems appropriate for a Witch Doctor. That looks real to me. I've never played a witch doctor, but occasionally witch doctor items drop, and they generally have crazy names like this one. Are character names unique in Diablo 3? What is the max number of sockets for each equipment type? How can I search a rare item by name in the Auction House? What does the star that appears next to my Journeyman Craftables mean? Why am I not getting the full health regeneration bonus from my follower? Can I go back to do a quest and then come back to where I was? Is there a way to know if an item has been bought on the auction house? Where can I find “Ascended” items for level 70 legendary crafting? Can Green Set Items be picked up by other players?